Every December, thousands of students shake off the stress of finals and pack up to head home, excited by the idea of relaxation and home-cooked meals. Yet, for some this is a time of anxiety and uncertainty when the residence halls close and they have nowhere to go. This holiday break, UC Santa Cruz senior and resident at Crown-Merrill apartments Sarah Harker will join the over 300,000 identified houseless students in California, the highest amount of any state. Harker will have to leave her apartment on Dec. 10 and prepare for her seventh move in three years to a new and temporary home. Since her first year at UCSC, Harker has been unable to live with her family due to the alcoholism and mental illness in her immediate support system. Because of this lack of a “life-line” Harker said, she’s often lived on the couches of friends and extended family members during past campus closures. 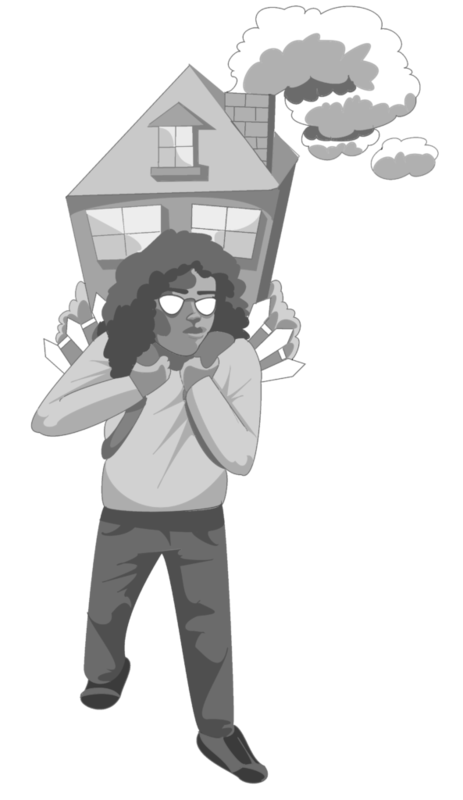 While the UC system doesn’t have statistics on student houselessness, a 2015 California State University (CSU) report found that 1 in 10 CSU students are without a permanent home. Last year, Gov. Jerry Brown signed Assembly Bill 1228 into law, which requested all UCs and other public California universities make accommodations for former foster youth and houseless students. These accommodations include guaranteeing priority housing and on-campus living during school breaks. However, because the UC system is not directly under control of the Legislature, the UCs do not legally have to implement these accommodations. At least a dozen students every winter break request help from the university to find emergency housing during campus closures, Rojas said, although the total number of students who face houselessness is projected to be much higher. Students like Sarah Harker, who are displaced by campus closure, have few options to choose from. Some choose to live out of their cars or couch surf, others reach out to the UCSC Police Department or the Slug Support Program, or they request to be in the Smith Renaissance Society. The Slug Support Program, created in 2011, aims to “promote early intervention with students of concern to prevent culminating problems from escalating into a crisis,” according to its website. A student must be referred to the program either by someone in the UCSC community or be self-referred, according to the website, to receive services such as rental assistance or emergency access to food and hotel-housing during campus closure. Currently, the Slug Support Program houses students at the Mission Inn at no cost, but because this program is intended for transitional or emergency situations, only 3-5 nights are fully funded, said interim dean of students Lucy Rojas. Colleges, Housing and Educational Services (CHES) at UCSC offers longer stays at the Mission Inn for houseless students at a rate of $45 per night. Although many are unable to afford the entire cost of this program, once nicknamed the Holiday Hostel, many students do benefit from this resource with financial assistance from the university, said associate vice chancellor of CHES, Sue Matthews. Because of her inability to pay the entire cost of hotel-housing, Sarah Harker prefers to look elsewhere for shelter during campus closure. While providing housing is not one of the Smith Renaissance Society’s main initiatives, many dozens of students, like Harker, are able to find housing through their mentors or Senior Fellows in the group. Shawn Cervantes, president of the Smith Renaissance Society, has housed six students over the last three years in her own home during campus closure, noticing that many who struggle with housing security also struggle with food insecurity. The Smith Renaissance Society started out as a scholarship founded by Bill Dickinson, an alumnus from the first graduating class at UCSC, in 1999 but later grew into what it is today because of community support. Most of the group’s funding comes from individual donations from community members and UCSC alumni. Their fundraising efforts from last year totaled $39,400 on the UCSC Crowdfund page, whereas most other fundraising efforts ranged from $1,000 to $10,000. Throughout the year, the Smith Renaissance Society aims to support students who otherwise have little or no parental support system including former or current foster youth and undocumented students who are here without their families. They offer assistance in finding emergency housing and financial assistance for those struggling with food insecurity. Many on-campus students who are facing houselessness this upcoming break are among hundreds of thousands of houseless students in California who will be eagerly awaiting schools to reopen their residential and student services. Correction: The price and name of the emergency housing program operated by the Slug Support Program was mistakenly stated as The Holiday Hostel. 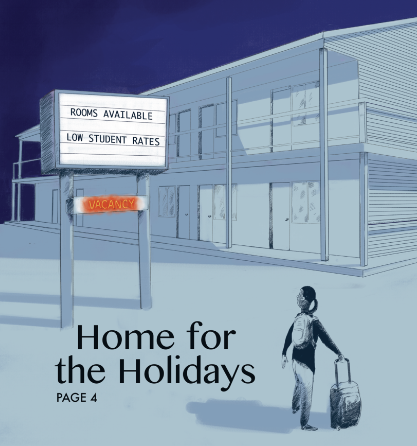 The CHES department program has been nicknamed the Holiday Hostel, whereas the Slug Support Program has never been named as such. It was also mistakenly stated that the Slug Support program charges $45 nightly for students in emergency housing need staying at the Mission Inn. The Slug Support program does not charge these students.